An SS7 protocol stack is the hardware and software functions of the SS7 protocol which are divided into functional abstractions called "levels". 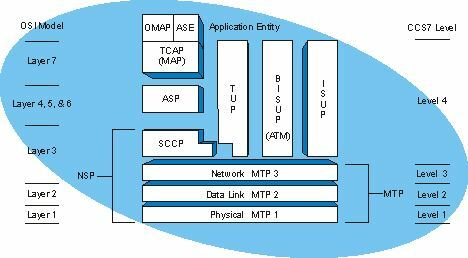 These levels map loosely to the Open Systems Interconnect (OSI) 7-layer model defined by the International Standards Organization (ISO). Together these levels are called the SS7 Protocol Stack. This diagram shows the SS7 protocol stack and how it relates to the OSI 7-Layer Reference Model. The bottom half of the SS7 protocol consists of the Message Transfer Part (MTP). There are three levels to the MTP: Level 1 corresponds to the OSI Layer 1 (Physical Layer): Level 2 corresponds to OSI Layer 2 (Data Link Layer): and, Level 3 corresponds to the bottom of OSI Layer 3 (Network Layer). The upper half of the SS7 protocol consists of several parts. The SS7 Signaling Connection Control Part (SCCP) corresponds to the top of OSI Layer 3. The ISDN-User Part (ISDN-UP) maps onto OSI layer 3 as well, and, in addition, it maps onto Layer 4 (Transport Layer), Layer 5 (Session Layer), Layer 6 (Presentation Layer), and Layer 7 (Application Layer). The Transaction Capabilities Application Part (TCAP), the Application Service Elements (ASE), and the Operations, Maintenance and Administration Part (OMAP) of the SS7 protocol all map onto OSI Layer 7 as well.